This week we had Registered Dietary Nutritionist, Jeanne Petrucci, from Living Plate present in our Parent Education Series on Raising Competent Eaters. 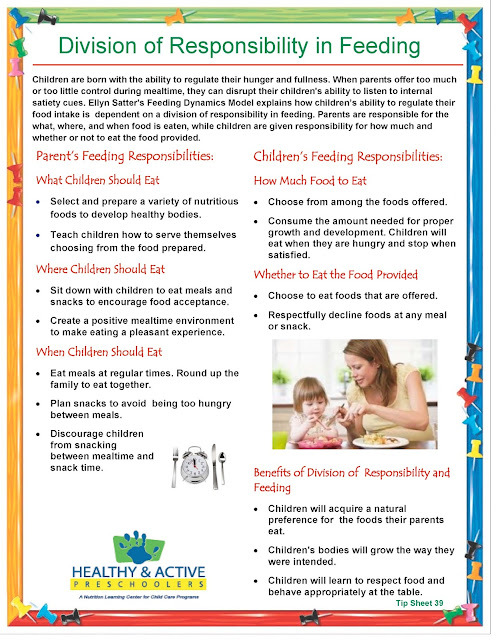 The parents in attendance received some practical and very Montessori-friendly, advice including learning about the research-based method of feeding children endorsed by the American Academy of Pediatrics called Division of Responsibility in Feeding. Like with the Montessori Method, the adult is responsible for providing the environment and choices that are acceptable for the child. The adult is the role model for good behavior and sets clear expectations for those behaviors. The Division of Responsibility in Feeding method eliminates all need to cajole, bribe, threaten, or manipulate children into eating certain foods or amounts, methods that research has shown to actually worsen poor eating habits. This abbreviated article was written by Julie DeNeen, and as a Montessori educator I was struck by the fact that she was describing the advantages of a Montessori Education without ever mentioning the word Montessori. 1. Learn how to learn.There is a difference between regurgitating materials on an exam vs. understanding the process of learning. Students who aren’t given the opportunity for independent learning don’t acquire the skill of HOW to learn and how to examine a principle from multiple angles. The teacher stands in the way of the student’s natural curiosity. 2. Independent learning focuses on the process and not simply the goal.The process of learning is an exciting adventure that can be interrupted when the primary focus of the classroom is on the goal. We can learn from famous inventors whose failure in the process became the seed for amazing success down the road. 3. Flexibility for different levels of intelligence. Not every student is going to work at the same pace. A facilitator in the classroom can oversee the environment so that each student can work at their own pace and timing. 4. Independent learning includes time management and other life skills. Traditional classroom environments can hamper a child’s ability to function in the real world where deadlines, distractions, and other obstacles are in the way. Bosses on the job don’t act like teachers. 5. Passion and curiosity cement learning. Can you imagine the difference in motivation if you allowed a student to research a topic that truly piqued his or her interest? 6. Internal satisfaction.The world isn’t going to cheer us all on always. When things get tough, those who don’t quit are the ones who are determined to rely on their own sense of satisfaction and not someone patting them on the back. Students who have a facilitator rather than a teacher will come to depend on themselves for a job well done. 7. Independent learners are more aware of their own strengths and weaknesses. A weakness is only as dangerous as the level of ignorance the person has about it. Independent learning forces students to grapple with both their strengths and weaknesses through the educational process. 8. Students learn how to educate others.If a facilitator invites the student to plan the lesson, then he or she is also learning about how to teach someone else. 9. Students can self-critique more effectively. When the process is part of the goal, failure isn’t quite so scary. When the fear of failure disappears, it is much easier to learn the art of self-critique. 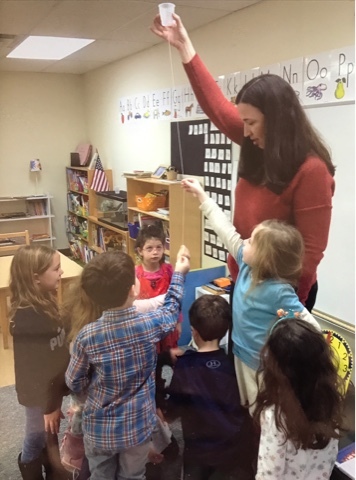 Through the use of hands-on materials and teachers who are willing to teach by asking more questions, students in a Montessori classroom are encouraged to experience and learn from the world around them. Just this week we were learning about sound in the Kindergarten class. It started with a group conversation that began when one student asked why when he moves his mouth sometimes sound comes out (words) and other times no sound comes out. From there, we were able to talk about our vocal chords and children rested their hands gently on their necks while speaking and whispering to feel the vocal chords when they were vibrating and when they were at rest. The children were astonished to learn that sound is made (and heard) through vibrations! The next day the children were delighted to find several new activities in the science area. There was a diagram of the parts of the ear, a few books about hearing, and materials for making a telephone out of paper cups and string. But this is just where the learning began! Because the children were given the tools to learn, rather than the answers of how sound moves through objects, the children started to experiment with the tools they were given. Soon children were making telephones out of different types and sizes of cups, changing the string to yarn, and creating very long strings to see just how far their voices could carry. They also discovered that the cups amplified more than just their voices and soon were making musical instruments out of their telephones, strumming and plucking the strings to make different sounds. They even discovered that the farther away you plucked the string from the cup, the more the tone of the sound changed! All of this experimenting brought up more and more questions about how sound worked and with each new question, a new experiment was invented by the children to discover the answer. This is the real purpose of education, to inspire thinkers, creators, analyzers, collaborators, and learners.